Magnesium is a natural aid to restful sleep and relaxation and according to BetterYou™ when you use their Magnesium Oil Goodnight as part of your night time regime the formula helps to promote deep relaxation to send you off into a peaceful sleep. 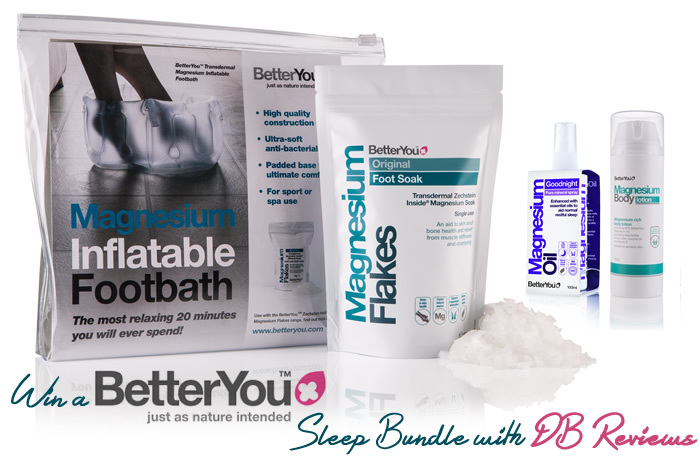 Achieve a successful slumber with BetterYou Transdermal Magnesium, a natural aid to restful sleep and relaxation. Without magnesium our bodies are less supple, and deficiency is linked with many health implications including migraines, anxiety, depression and extreme fatigue. Transdermal delivery (through the skin) has been proven as the most effective way to supplement magnesium. A quick spray before bed will combat irregular sleep patterns. The unique blend of essential oils soothes the senses and combined with pure magnesium chloride helps to relax the body by relieving muscle tension, stiffness and cramping. A soothing soak in magnesium rich bath, using the award-winning BetterYou Magnesium Flakes, will leave you feeling relaxed as well as effectively replenishing your body’s levels. BetterYou has also introduced the perfect partner to its Magnesium Flakes – a Magnesium Inflatable Footbath. With the feet amongst the most absorbent areas of the body and perfect for magnesium replenishment – the footbath can bring the luxury of a spa treatment to your own home which will be followed by a wonderful slumber.